Kellie Harrington lands a right hand on Amy Broadhurst during the 2018 National Senior Elite final at 60kg. THERE ARE NO red carpets rolled out during the weekend shift at St Vincent’s Hospital, even for world-champion members of staff. And that’s only from the patients. Thankfully, Kellie Harrington has the patience of a saint. The weight of world honours dictates that she regularly puts it to good use these days when strolling the north east inner city streets on which she is considered a god. The Dubliner remains rooted in reality even after producing a miracle. Her people’s presumptions are water off a duck’s back. Harrington has always evinced the sense that she’s as proud of her fellow inner-city residents as they are of her, as they’ve always been of her. Local kids would join her on her runs long before she conquered the world, or before she even dared to believe she could. Many of them believed in Kellie Harrington before she believed in herself. The 29-year-old is speaking at the launch of the Olympic Federation of Ireland-backed ‘Dare to Believe’ initiative, a programme supported by the Athletes’ Commission which will see Olympism, Paralympism and the benefits of sport promoted in primary schools nationwide. Beginning in fifth and sixth classes during its pilot stage, teachers and students will receive resource packs with a range of activities and information based on five rings: Olympism and Paralympism, Healthy Mind and Body, Joy of Effort and Courage, and Respect, Responsibility and Equality. The final ring is entitled ‘Striving for Excellence’ and involves a high-performance athlete, Olympian or Paralympian telling the class about their journey towards the pinnacle of their sport. Harrington was a “bold child” as she puts it with a wry smile, but she won’t be drawn any further on how boxing righted her course until she gets around to writing a book. “Youse’ll all think I’m some angry bird,” she laughs. What we know for certain is that she was long removed from the classroom by the time she began to harbour any kind of Olympic aspiration of her own. Asked for how long she has mulled over the mere prospect of taking to the ring beneath the other five, the world’s top amateur lightweight replies with a shrug of her shoulders: “Emmm…. About two years. It’s not a childhood dream of mine to go to the Olympics. It developed, then, as I got older, and the whole Olympic thing only… Well, it didn’t only develop recently — I’ve known about the Olympics since I was a kid. But where you see other athletes going, like: ‘I sat in front of that telly when I was four and a half years old and I thought I was going to be there one day’ — I can’t even remember when I was four and a half years old. “Like, I never really believed in myself up until a few years ago. And people never really took me seriously as a female boxer, but as a boxer as well. So, then when people started to take me seriously I started to believe in myself a bit more and think that I could go on and I could actually do well at European and world level. “And people were talking about the Olympics and the Olympics and the Olympics, and I used to brush it off and say, ‘Yeah, well, baby steps. Crawl before you can walk.’ Because I look at the short term and not the long term. “The medal in the World Championships in 2016 — when I got that I thought, ‘Ah, that was lucky.’ European Union [Championships in 2017], I got silver and I was like, ‘Ah, I must have been lucky again.’ And then, I got a medal in the Europeans — last year, I think — and then a gold in the Worlds. I dunno, like… I’m just a very lucky person, I think,” she laughs. She’s prone to playing down her plethora achievements with a wink and a nudge, but the seriousness with which she treats their accompanying platform is evident with Harrington more so than most. Take, for example, an otherwise inconsequential moment at the press conference for last Saturday’s Irish Senior Elite Boxing Championship finals, one caught by the keen eye of Irish-boxing.com journalist Joe O’Neill: Harrington was approached for an interview in front of the RTÉ cameras but first insisted that her St Mary’s BC club-mate George Bates — a finalist at 63kg — join her and gain some of the exposure that she now scarcely needs by comparison. “That’s me as a person,” Harrington explains. “With George, I know how hard he had trained for it. He’s my club-mate and it’s not all about me. I like to share it out — it’s about other athletes as well. “George is a fantastic athlete and I was like, ‘Come on get in here, George!’ Now, he was trying to leg it away from me because he knew what I was up to,” she chuckles. On the memorable Elite finals night which followed days later, Harrington won a unanimous decision in an exhibition bout with the highly-rated Jelena Jelic, raising the Serbian-Swede youngster’s hand post-verdict to ensure she received her dues from a sizeable crowd on South Circular Road. However, she dismissed the idea that this was the act of a World Elite champion aware that she could briefly put someone over. Harrington squared off with Jelic only because she didn’t have a grudge match — or any match — pencilled in for the Irish Senior Elite final at 60kg. Her nearest competitor, the supremely talented Amy Broadhurst of Dundalk whom Harrington beat in the lightweight decider last year, won her first Irish Seniors last Saturday but up at 64, or light-welterweight. Broadhurst, seven years Harrington’s junior, has won more major medals at underage level — both of the national and international variety — than you could count on three hands, and is also the reigning English Senior Elite champion at light-welter, but as things stand doesn’t intend to come back down to challenge Ireland’s world champion on the domestic front. “I have to take a step back for Kellie ahead of the Tokyo Olympics because of what she’s just achieved, which I’ve accepted. Come 2024, though, I won’t be taking a step back — that’s my time. The Olympics has always been a dream of mine, and I’m not going to be waiting 10 years or whatever to get there. “Going into 2024, I think I’m going to be in my prime. In four years, I don’t think Kellie will be able to beat me. As a boxer, I have so much to learn and so much to experience, whereas she has already experienced it all. She’ll really be on her way out then, in 2024. She’ll be 33 or 34. Harrington, who knows a thing or two about waiting in the wings, interjects almost as soon as the Dealgan BC southpaw’s name escapes this writer’s lips. “I’m going to be quite frank about this because I’m hearing a lot about her ‘agreeing to step back’, right?” she says with a steely glare. “I beat her last year, and I would have beaten her again if she was there this year. So, when someone says they’re ‘agreeing to step back’, take it with a pinch of salt. I’m the number one Irish 60-kilo. She might be the number one U22 champion but she’s not the number one at 60, so whether she agreed to it or not, she had the chance to get in there and prove herself and she didn’t take it, like. “I like her, she’s a great young one, she’s a great athlete, she’s a fantastic fighter. But it is what it is. She apologises for the mild profanity. “As you can see, it does annoy me a little bit,” Harrington adds. “I didn’t ask her, ‘Oh, will you please step back’ or anything. No. She done it because she didn’t want to fight me, and that’s it. “People had been saying it to me and I’m just like, ‘I just… I actually don’t care.’ Take the shot, like. “I didn’t fight Katie [Taylor] because I didn’t believe that I would beat Katie. I say how it is, like. I didn’t believe I would beat Katie at that time. “When I weighed into my first 60 kilos [Elites in 2016], I didn’t know whether Katie would be there or not. I believed that I would beat her at that stage. But I had never [previously had] the confidence to believe that I would beat her, and then it grew. 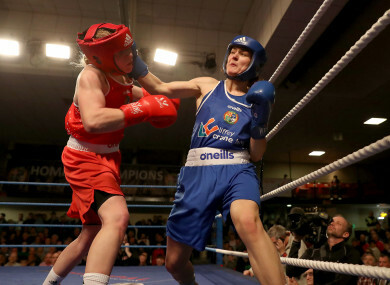 “So don’t go around saying ‘I’m stepping back to give you a chance, I know how hard you fought for it’ and all, like,” she says, sounding a warning to Louth’s ‘Baby Canelo’. “I wasn’t surprised [that Broadhurst decided not to challenge] because I beat her last year, and I beat her fairly well,” Harrington continues. “I wasn’t surprised at all. If you want to be sent away for your country, you’ve got to win a national title. You’ve got to fight at 60. If you’re not in, you can’t win. I fought at 64 long enough because I knew that I wasn’t going to be sent at 60 and I hadn’t got the confidence to beat Katie at that stage. I knew I wasn’t going to beat her because once you haven’t got confidence and you don’t believe in yourself, you’ve already lost before you get in. When it’s put to Harrington that theirs could become a celebrated rivalry should Broadhurst decide to pull a U-turn and challenge her — this only if Harrington doesn’t qualify for the Olympics in advance of next year’s Irish Elites — the nine-time national champion doubles down on her stance, albeit while refusing to flat-out dismiss Broadhurst’s ability. “It’s not a rivalry at all to me,” she says. “To be honest with you, it’s just people talking gibberish, people talking nonsense — that’s all. “The young one’s going to go on and she’s going to do good things in her career, and in 64 kilos I can see her going on and doing good things. The conversation pauses for all of four seconds while the dust settles. Content that she’s said her piece on the topic, Harrington smiles and feigns a mic-drop, complete with a “Pttch-ssshhhh” sound that will doubtless reverberate its way as far as Dundalk. But her indifference to Amy Broadhurst as ‘competition’ shouldn’t be mistaken for arrogance. The mere mention of another fighter — an opponent whom she shares with Katie Taylor — suffices to prove that despite her own status as the world’s top-ranked 60kger, Harrington is still looking up, not down. “D’you know, what, right? That woman, she actually inspires me,” she says of Mira Potkonen, who dumped Taylor out of the Rio Olympics at the quarter-final stage and has since bested Harrington at the 2017 EUs and 2018 Europeans. The Finn lost to Sudaporn Seesondee in last year’s World Championships before Harrington edged out the Thai in the showpiece to become only Ireland’s third-ever amateur world champion alongside Taylor and Michael Conlan. “It’s crazy, like. She’s a role model for me, Mira. “She has two kids, she’s thirty… I think she’s 39, now, is she? I remember trying to add it up and thinking, ‘Yeah, she’s going to be 40 in Tokyo.’ I think she’s going to be 40 in Tokyo, anyway. But she has two kids, we’ll say she’s 37 or 38, and she is getting better, like. She’s not technically great, but she’s basic, and what she does works. And she’s a nice person, and it’s just great to see someone like her… For me, she’s a role model, and I love fighting her. “The first time I fought her, the first round I was winning easily, and then halfway through the second round I just died. And it was survival mode then. And she won the fight, like. Split decision, but I dunno, she won it. “Second time I fought her, I thought I’d done enough to get the decision. And I think she was quite shocked, as well, because I went forward a little bit more. The second fight was enough for Harrington to banish the bashing she had taken in the first, so much so that she doesn’t perceive Potkonen to be a thorn in her side despite the fact that she’s yet to get one over on the fine-wine Finn. “I still feel that I won the last one, like. I mean, I’m not a sore loser by any means. If I lose a fight, I lose a fight. I’ve had more losses than I’ve had hot dinners, for God’s sake. I’ve been annihilated [in Cascia, Italy v Potkonen], absolutely slaughtered. “I got out of the ring and lost on a split decision, and I couldn’t believe I lost on a split decision. I was like, ‘What were they watching? I lost that clearly.’ I was truthful. I felt I did enough in that [second] fight to get the decision. So, I feel like each time I’m getting closer. We’ll see the next time. She knows now that I’m closer to her, so she’s going to be working harder as well to up her game. Perhaps, apart from her adversary’s humility, one of the reasons why Harrington is so fond of Potkonen is the fact that she knows she herself will be long gone from the ring when she’s 38. Tokyo, provided she makes it, might yet prove to be a curtain call in the national-team vest for the Irish great. She’s open to the option of a move to the punch-for-pay ranks, but only if the money is right and the contract is fixed: two years, X number of fights, world titles. She doesn’t want any “flash things or anything like that”, she says. “If it’s going to cost me more grief then it’s worth, then I’ll say no. Then I’m out of here. I’ll keep working in Vincent’s and I’ll keep doing what I’m doing. And hopefully I’ll get a job — make sure you put this in wherever you’re putting it — in the High Performance [Unit], coaching as a high-performance coach, with female athletes coming through. “It would be great to have me in there!” she laughs. “That’s what I’d love to do: go into the coaching end of it. That’s not saying I’m going to be a great coach because every boxer doesn’t make a great coach and it’s the same — every coach wasn’t a great boxer. But I’d love to get into coaching for the technical end of it. I like teaching the technical end of boxing. Irish lightweight women’s world boxing champion Kellie Harrington, Irish Olympic rower Claire Lambe and Paralympic swimmer Nicole Turner teamed up with the Olympic Federation of Ireland to launch Dare to Believe, a school activation programme championed and supported by the Athletes’ Commission. Olympism, Paralympism and the benefits of sport will be promoted in schools nationwide by some of Ireland’s best known and most accomplished athletes in a fun and interactive manner. The initial pilot phase is targeting the fifth and sixth class students in primary schools. Visit www.daretobelieve.ie for further information on how to get involved #DareToBelieve. Email “'I would have beaten her again... She didn't have the balls to step up and take the chance'”. Feedback on “'I would have beaten her again... She didn't have the balls to step up and take the chance'”.